Kiora is rapidly learning that evil and lies come in shades of black and white and swirling greys, but nothing could have prepared her for the shock of leaving Meros. Kiora and her protector Emane step through the pass into a world they never knew existed but were always meant to save, only to find it far worse than they could have ever imagined. Good has been forced into hiding for its own survival, while the rest of the land bows to the Shadow, a force that pushes any remaining thoughts of Dralazar from Kiora’s mind. This land is full of new creatures, each more dangerous than the last. Her visions have taken on a deadly twist, and magic, or what comes of it, was never so real. And then there is Alcander: a Tavean, their guide, and an entirely different kind of trouble. When reading fantasy-themed sequels, I usually have a rather difficult time reimmersing myself to the different worlds. Upon reading the first few pages, I often find myself bombarded with heaps of information that I have already learned some months ago but have forgotten and as a result, reading fantasy sequels becomes a chore and not really a task that I enjoy doing. Info-dumping simply isn't enjoyable, no matter which way you look at it. Honestly, I cannot even begin to count the number of fantasy series that I have ended up giving up on, and I truly felt worried that The Solus Trilogy would be another of those series. Thank God I couldn't be more wrong! Devri Walls is one heck of a gifted writer. 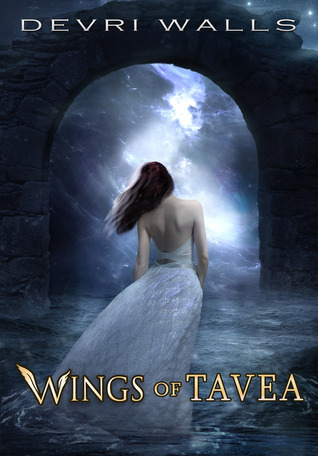 Wings of Tavea picks up where Wings of Arian left off, and I'm happy to note that already-learned information wasn't thrown around haphazardly in the initial chapters. Though this might be the case, I found it rather astounding that Walls somehow still managed to refresh my memory of all the things I have forgotten about her world through subtly thought-prodding passages spread throughout many pages here and there. I loved that she managed to completely reimmerse me in her world through select words, and that overloading of information was completely unnecessary.I don't know about you guys, but this for me is what makes a writer phenomenal, and Walls is truly that. Her writing flowed smoothly; the plot is fast-paced, and I found that I couldn't stop myself from reading more about this magical world. I'd also like to once again commend Walls on how she portrayed all her characters, but most especially Kiora. She somehow managed to toe the line between Kiora being overly emotional and overly strong, and in the process created a character that is both unique and relateable. I also love how Walls ceaselessly stresses that the fact that Kiora feels pain is what contributes to her immense power, yet she also gives this character enough time to accept that it simply isn't possible for her not kill while on her mission. Moreover, character growth is aplenty for all the main characters - Kiora, Emante, Drustan, and the newly-introduced Alcander go through their fair share of self-realizations. We also get to know more about Drustan's past, and just what made him turn against Dralazar. The hints of a love triangle between Kiora, Emante, and Alcander is introduced to readers as well. Nothing about this triangle felt forced - it was rather well-written in the sense that we get to see how Kiora is with both men, and it really cannot be denied that she has unparalleled connections with both. I have no idea how Walls will resolve this part of the story, but I truly cannot wait to find of what else is in store for these three in the final book of the series. I'd also like to stress out that while the romantic subplots are integral parts of the general story, Walls made sure that not too much of the novel was devoted to them. Too much romance can be overkill, after all! All in all, the Solus Series can be enjoyed by both adults and non-adults; and by avid and non-avid readers of the fantasy genre. I truly did not expect that I would fall in love with this world and these characters, but I did, and I'm eagerly anticipating the release of the final book! I looooove reading comments, so do know that I read every single one of them. Also, if you're a new follower, let me know so I can check out your blog! Call me Lyra. I read books of varying genres, but I mostly review YA books. I started this blog quite recently, but I'm slowly but surely getting the hang of things! Email me at lyra.gill@gmail.com for review requests, blog tours, author interviews and the like or if you just want to chat. I would love to meet all of you!